Budget-Friendly! Limited Quantity! Ships Fast! 1 Year Warranty from Microsoft Registered Refurbisher! Full 1 Year Warranty! Fast Fast Shipping! Hot Price! 1 Year Warranty! Fast Shipping! Up for sale, 1x Lenovo IdeaCentrethat's been professionally tested and in good working condition. We kindly ask that you inspect your unit once it is received and be sure it is as described. Blowout price! Fast shipping! 1 year warranty! Dell Inspiron 620 Desktop Computer. Front door panel missing that covers the front USB A/V inputs. Also the front USB cable is not hooked up to the motherboard. Has a 14 month subscription to McAfee Virus Security. Refurbished HP with 1 Year Warranty! Fast Shipping! 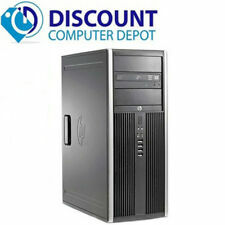 Refurbished HP with 1 Year Warranty! Free Shipping! 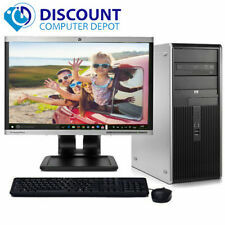 ---Intel Dual Core 2.0GHz Processor ---8GB Memory Installed ---160GB SATA Hard Drive ---DVD Optical Drive ---Ideal for both Home and Office use ---Genuine Microsoft Secure Anti-Virus ---Wire and Wireless Internet ready ---Loaded w/ Genuine Windows 10 W/ Certificate of Authenticity (COA) recovery partition is included (This computer HAS a newly attached License/Certificate of Authenticity (COA) along with the ORIGINAL COA) ---External ports ---8.0 x USB 2.0 ports (2 front, 6 rear) ---Ethernet Network (RJ45) (1 GIGABIT) ---VGA Out ---Speakers, line-out ---Microphone-in The package includes ---Computer ---USB WiFi Card ---New Wired Keyboard and Mouse ---New Windows 10 COA ---Cables ---Paper Work Don't run the risk of purchasing a computer with risky, illegal software and subjecting your computer to piracy and viruses. USB WiFi N adapter. 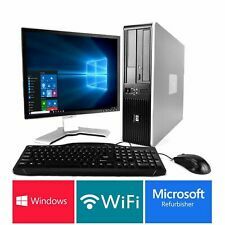 Off-Lease Refurbished PC. Wire AND Wireless Internet ready. ​​​​​​​(YOUR MACHINE WILL RUN 5 - 20 FASTER). 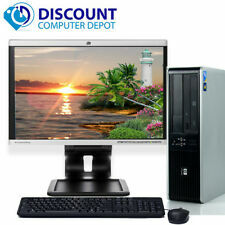 This warranty includes any hardware defects and EXCLUDES any software issues, neglect, or unauthorized repair. 1 Year Warranty! Fast Shipping! Fast Performance! Limited Quantities! Hot Price! Fast Shipping! 1 Year Warranty, Fast USB WiFi ADAPTER! Great Deal! Fast Intel Dual Core Computer. Ships fast! VERY LIGHTLY USED DELL INSPIRON 545S TOWER PC ORIGINAL SPEAKERS. SEE PICS FOR THE ACTUAL UNIT BEING LISTED. Great working conditions. refreshed windows 10. With mounting plate. Sony Vaio 19" All In One Desktop Computer Used PCG-272L has white screen.